Republican presidential candidate Donald Trump fields a question from Univision and Fusion anchor Jorge Ramos during a press conference held before his campaign event at the Grand River Center on August 25, 2015 in Dubuque, Iowa. The most-watched Spanish-language network in the United States still can't land a press credential to Donald Trump's campaign events. A Univision spokesman told CNNMoney on Thursday that the network's reporters continue to be denied credentials by Trump's campaign, nearly two weeks after a flare-up between the two sides. A Trump spokeswoman reiterated the campaign's view that until the candidate's $500 million lawsuit against Univision is resolved, granting credentials to the network's reporters amounts to a "conflict of interest." The campaign first invoked this reasoning on October 23 when Univision news crews tried to attend a Trump campaign rally in Florida. Requests for credentials were rejected. The campaign's snubs have continued, requiring Univision to get video of Trump's rallies at times from other news outlets. Trump has had a tense relationship with the press throughout his bid for the Republican presidential nomination, repeatedly lashing out at journalists over what he deems unfair treatment. Two other outlets, The Huffington Post and the Des Moines Register, have likewise been denied credentials to Trump events. But the decision to shun Univision is notable in that it represents a conflation of Trump's campaign and business interests. His lawsuit against Univision was prompted by the network's decision in the summer to withdraw from carrying the Miss Universe pageant, which at the time was owned by Trump. Univision dropped the pageant after Trump made disparaging remarks about Mexican immigrants during his campaign launch event on June 16. 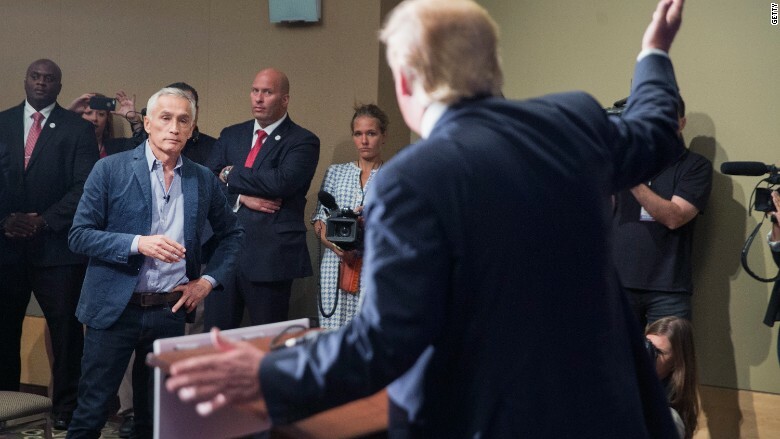 The tension between the two sides continued in August, when Univision's Jorge Ramos, the most popular Spanish-language news anchor in America, was booted out of a Trump press conference in Iowa. Ramos was eventually allowed to return to the presser, where he and Trump had a lengthy exchange over immigration. The feud with Univision is just one part of Trump's messy relationship with the Hispanic community. Hispanic groups have been angered by his selection to host "Saturday Night Live" this weekend sending letters and petitions to NBC to revoke the invitation. On Thursday, a group called DeportRacism.com offered a "bounty" of $5,000 to anyone who disrupts his appearance while the show is on the air. Trump's campaign isn't shunning all Spanish media. A spokesperson for Telemundo, the second-largest Spanish language network, confirmed that its reporters have received credentials to all Trump events for which it has requested them. At a press conference earlier this week to promote his new book, "Crippled America," Trump spoke affectionately about Telemundo when he called on a reporter for the network. "I like Telemundo, by the way," Trump told the reporter. "I like it better than Univision. I'm suing Univision for $500 million."